Atlantic Waves is an improvisational audiovisual network performance based on a self written network sequencing application. The original idea was to find a simple way to perform shows together with Scott Monteith ('Deadbeat') via the internet, but without streaming audio. Scott Monteith and me came up with it during a coffee break at the NAMM show 2001. 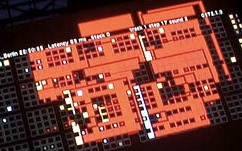 The first performance happened at the MUTEK festival Montreal in 2002 with me in Berlin and Scott on stage in Montreal. From the very beginning the project had a strong visual component since the interface is projected behind the performer. This allows the audience to follow the actions of both participants. 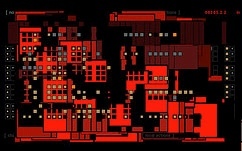 In more recent versions of the software the visual part became more and more an artwork in itself and the interaction between sound and image became much more complex. Remarkable performances included a show at the Turbine Hall of the Tate Modern gallery in London 2007 and one at the Centre Pompidouin Paris, also 2007 and both times with Torsten Proefrock ('T++') at the Monolake studio in Berlin, and one show with Scott Monteith at his studio in Montreal and me on stage in Bologna, Italy in 2006. Based on the the Atlantic Waves engine two installations have been created, Atlantic Wave Terminals, 2004 in Berlin, and Linear Grid, connecting the Museum of Modern Art in Luxembourg, MUDAM and the Philharomie Luxembourg, in spring 2007 and with two terminals set up at Todays Art Festival, Eindhoven, Holland in 2008. The heart of Atlantic Waves is a step sequencer, a large matrix acting as the score which can be created and modified in real time by both participants. This sequencer allows to draw notes into a grid on screen, visible for the audience as well as for the performer. The grid is a matrix of 15 rows and 32 columns, providing 15 independent instruments. Each row can be activated and controlled independently. If a track is active, a red dot is moving thru it horizontally. Each time this red dot hits a colored square set by one of the performers, a sound is created by the audio engine. This allows to create rhythmical patterns by drawing. Each performer has its own color, making it possible for the audience to follow who is doing what. The movement of the red scanning dot can be quite complex; each track can have its own direction, offset, speed and length, providing a simple but very effective way to create constantly permutating musical structures [sound example, created 02/08/2007]. In the first incarnations of Atlantic Waves the sound was composed of short percussive samples, created mostly by Scott Monteith. In the most recent version the samples have been replaced by real-time synthesis, providing more access to all parameters of the sound. While the sound design of the older versions was still very much modeled after acoustic or known electronic sounds, the latest versions provide a more abstract sonic quality which matches better with the more abstract visualisation. Since Atlantic Waves, Version V, the construction and deconstruction of the image is an essential part of the performance. At the beginning the visual structure of the sequencer is created. The creation process itself is linked to sound generation and can also be controlled by both performers. Later the structure is populated by elements in order to create the complex rhythmical movements. In a third step the interface is deconstructed while in use, and this has also a significant impact on the sound generation. These three parts of the performance can be repeated or interleaved since they are all part of the same process. 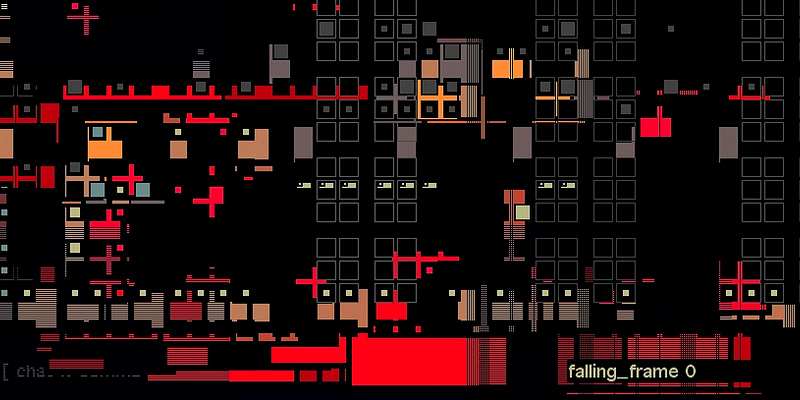 This makes Atlantic Waves a complex and powerful playground for audiovisual interactions. 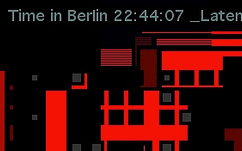 Atlantic Waves is based on a large MAX/MSP patch. All audio, networking and visual interaction is done within this patch. The patch also contains a chat feature, embedded in the graphical interface. This allows the audience to follow the chat between the performers. The audience gets exactly the same information as the performers. The software does not transmit any audio or video signals thru the network but just control data. The music and image is created in both locations simultaneously, synced and controlled by the commands of the performers. Providing a relay server in the future might make it possible to extend the number of performers, allowing three or more people to interact. This is planned for a proposed Version VI of Atlantic Waves.